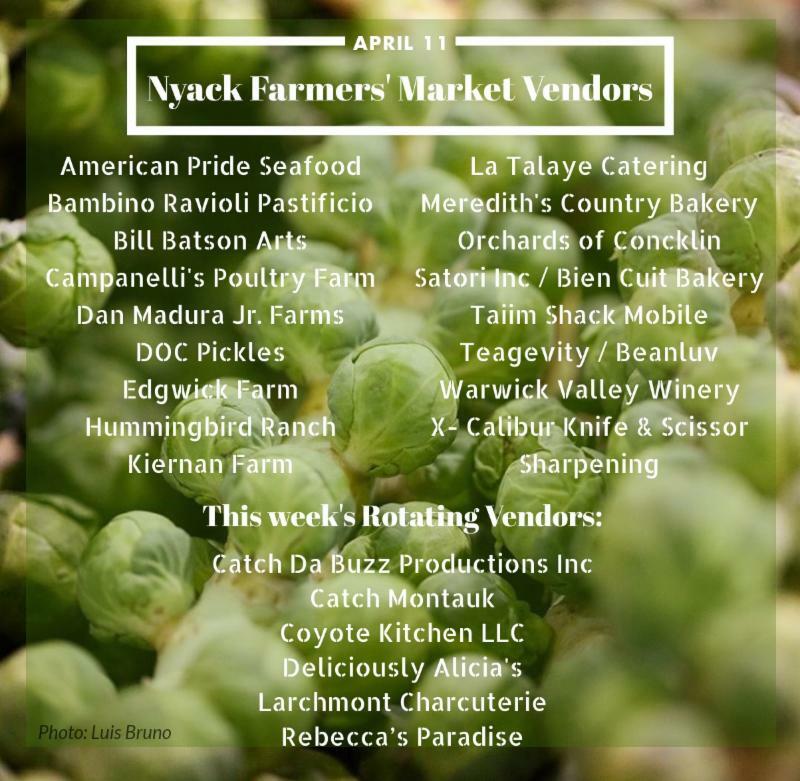 Nyack Farmers' Market - Outdoors for the Season! 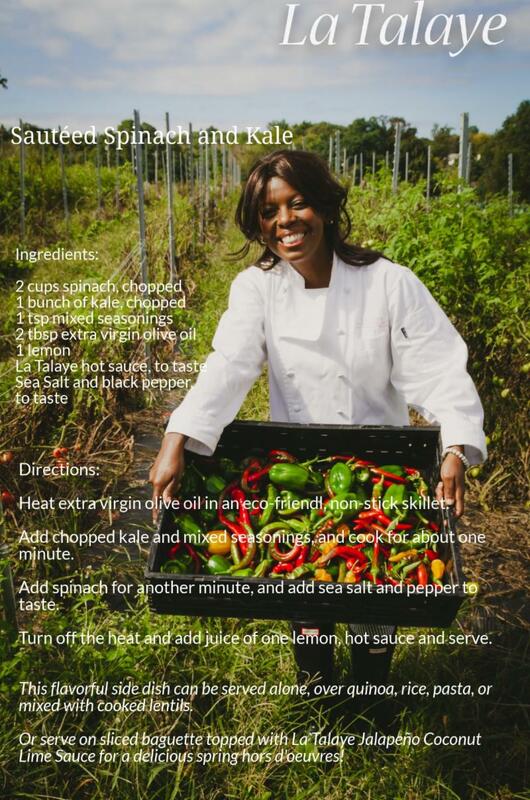 JOIN US AT THE OUTDOOR MARKET! Last week, we enjoyed an amazing opening day of the Outdoor Farmers' Market , and we expect the good vibes to keep on building throughout the season. New to the market are Bambino Ravoli Pastificio , who are putting a modern twist on traditional Italian pastas, sauces, and much more. 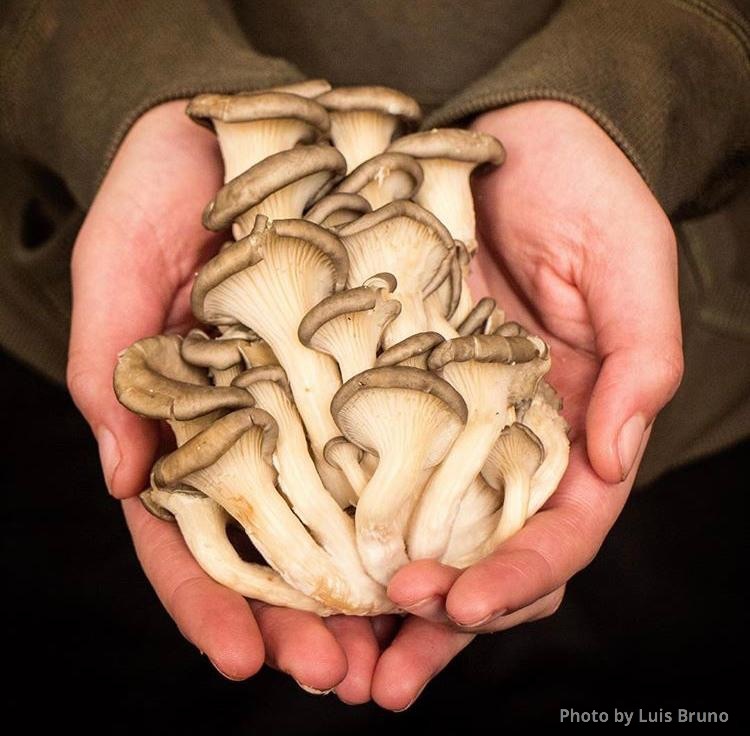 We suggest pairing their specialty ravioli with some of the incredible mushrooms from Dan Madura, Jr. Farms for a quick and hearty weeknight meal. 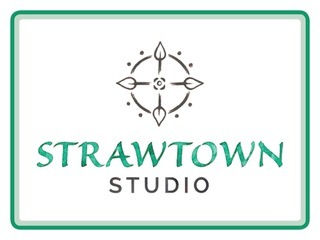 Help us welcome newcomers Catch Da Buzz Productions with high-quality hemp products and Deliciously Alicia's with gluten-free, vegan, and paleo versions of your favorite baked goods. 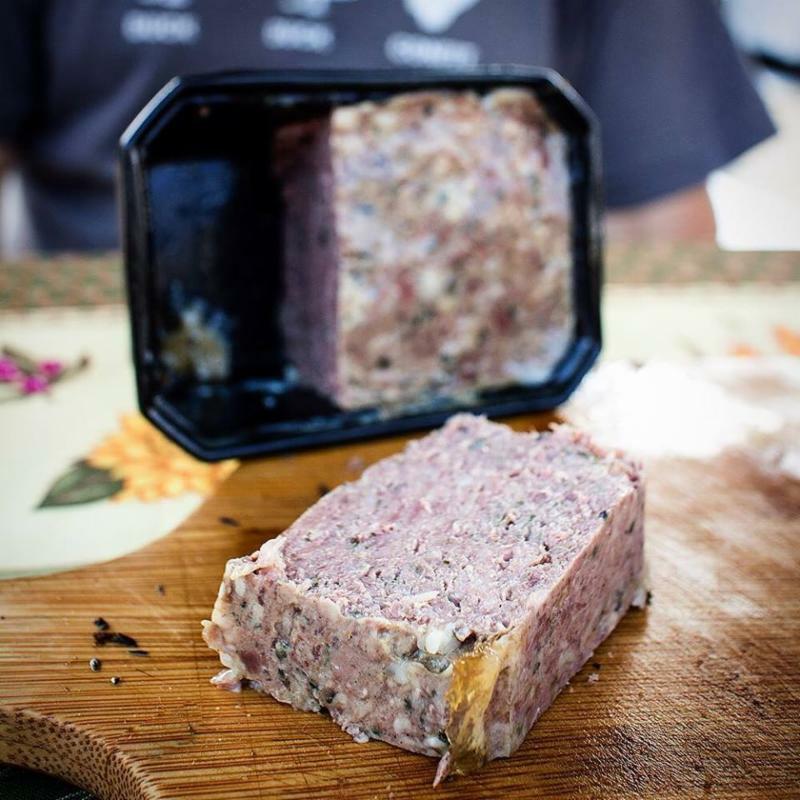 And returning for the first time this season is Larchmont Charcuterie , who pairs the meat curing traditions of the French Alps with top-quality, local ingredients. 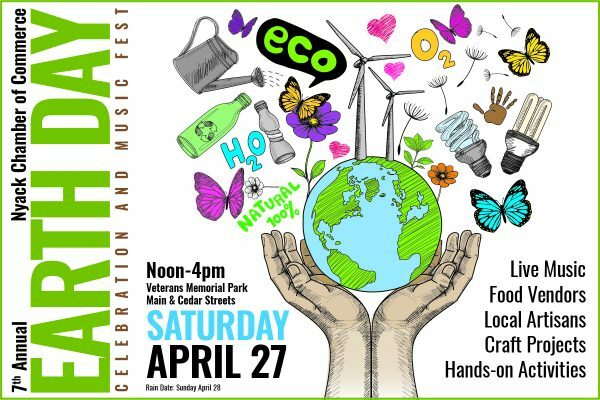 Also joining us at the market this week are sponsors Green Meadow Waldorf School and Green Mountain Energy . Be on the look out for Naturalist Educators from InSTEAD , learn more about the Nyack Basics Campaign , catch up with Ivan Szendro about his new film, and learn more about the Bring Your Own Bag campaign from Nyack High School volunteers. 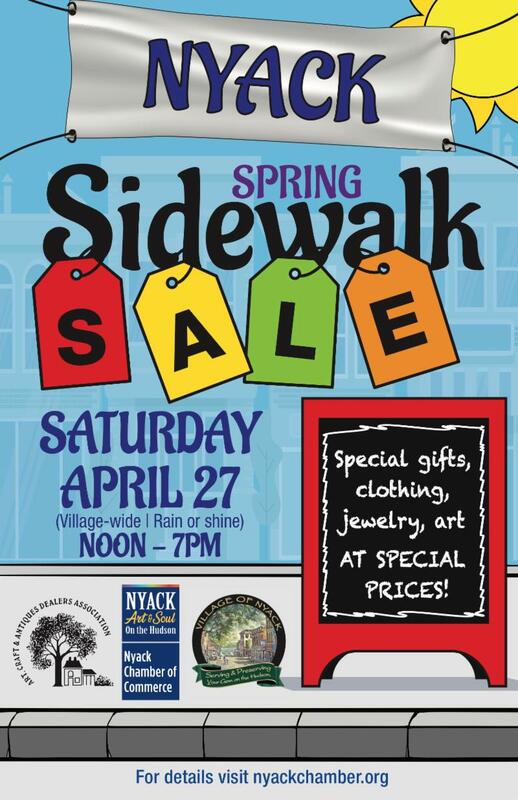 This week's weather looks wonderful for a wander around the market, so be sure to come see us in the Main Street Parking Lot this Thursday from 8am-2pm ! CBD products crafted using a high-end, gentle lipid infusion process — yielding the highest concentrations of healthy, amazing compounds found in hemp. It’s full-spectrum goodness on turbo-charge! Finn's smoked fish dips are smooth and creamy with a perfect balance of smokiness. Made from fresh, wild caught Mahi-Mahi and smoked over natural wood embers, this mild variety tames the “fishy” taste of many other smoked fish dips and spreads made from fish containing more oil. 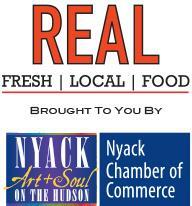 Also try their delicious salmon spreads and other smoked fish products. Delicious jams, jellies, and mustards that make the most of seasonal and stored produce. Sample unique flavors like blood orange & fig, strawberry & basil, figgy mustard, and dozens more at her booth, or pick some up to spread atop bread from Meredith's Country Bakery. Gluten-free, organic baked goods serving up everything from cookies to crumb cake to cannoli. Specializing in dairy-free, vegan, and paleo options, there will truly be something for everyone! The perfect marriage of French culinary tradition and high quality, impeccable American ingredients and safety standards. Come sample their beef and pork saucisson sec salami, beef bresaola, paté, and more. Perfect for protecting sensitive skin against harsh weather, this handmade skincare line is formulated using 100% pure essential oils, antioxidants and vitamins. Try their pure Himalayan Salt Body Scrub paired with Argan Oil and Eucalyptus Oil. The body scrub buffs away dead dull skin cells while leaving the skin soft, radiant and hydrated. Customers can enjoy original, live music while they shop! 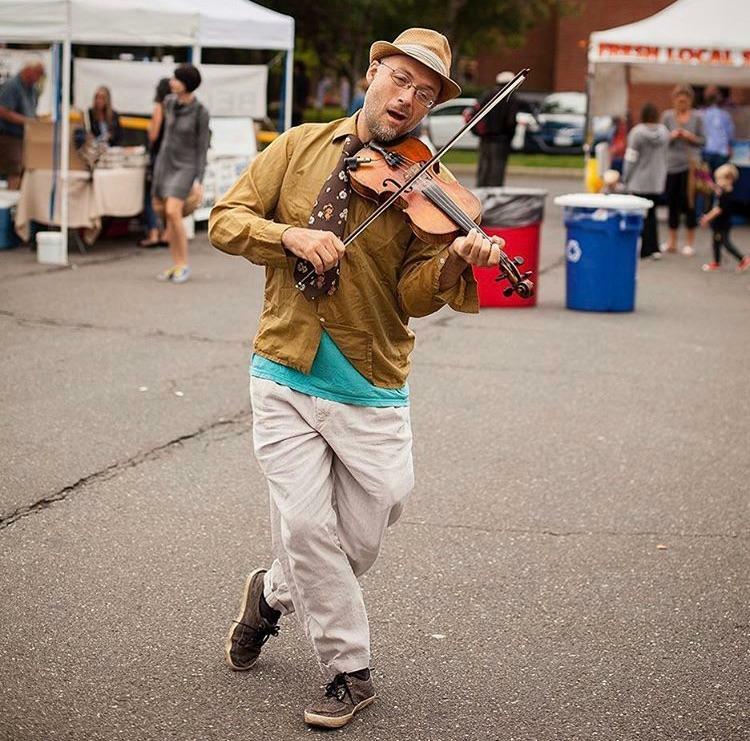 ﻿Check out our favorite fiddler as he offers weekly story time at the market! 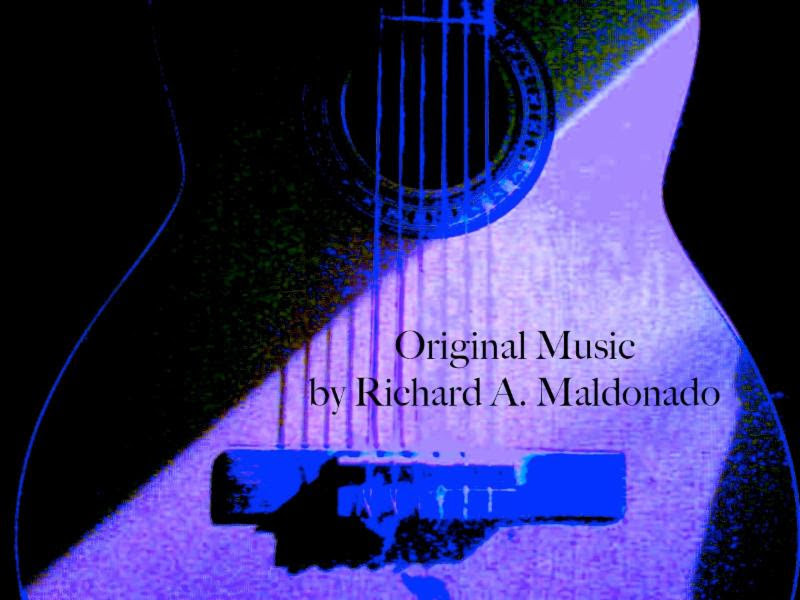 Ed plays a wide range of music including rock, folk, country, cowboy, and original songs from the '50's through the present. 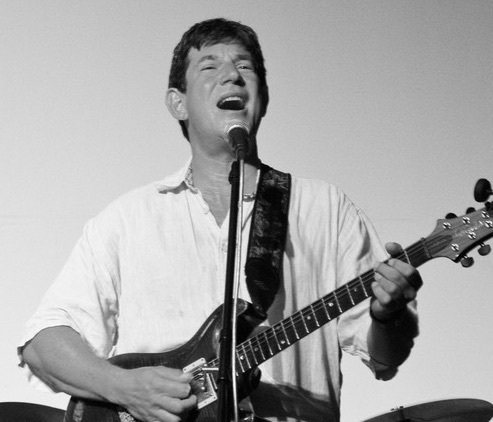 This soulful singer-songwriter's repertoire includes originals as well as Johnny Cash, The Beatles, Jimmy Hendrix and Cole Porter--just to name a few. He even takes requests! 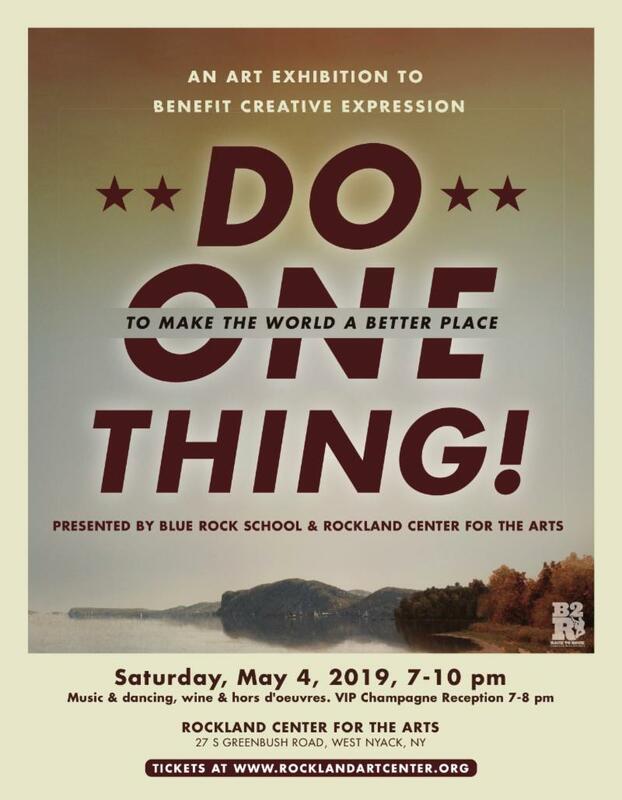 Blue Rock School , Green Meadow Waldorf School , Green Mountain Energy Company , HRH Care , Strawtown Studio , SunCommon , Nyack News and Views , and Rivertown Magazine for their continued support! 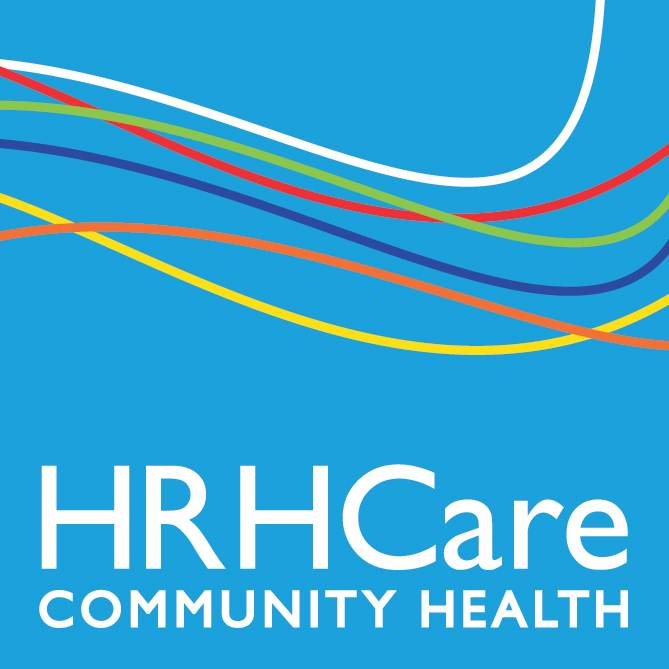 Click on the Flyers Below to See More Info! 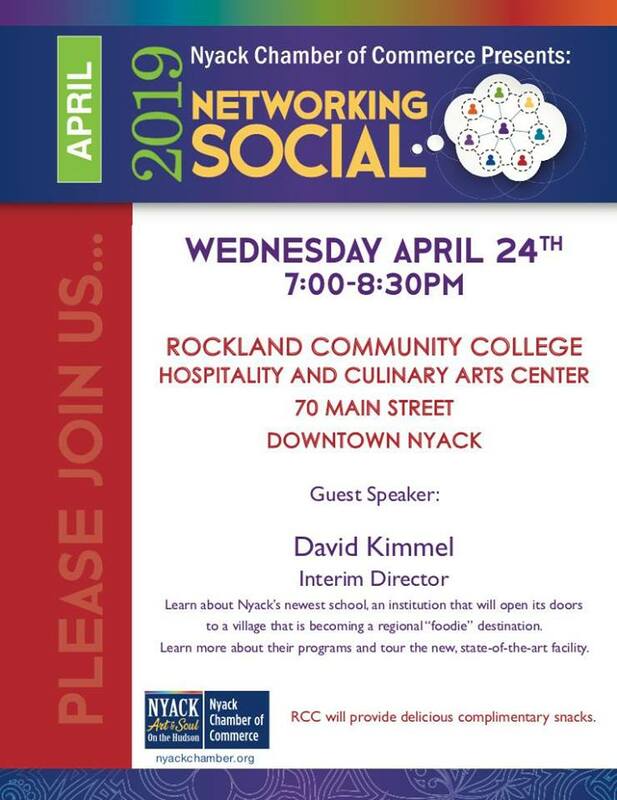 Join the Nyack Chamber of Commerce as we welcome the Rockland Community College's Hospitality and Culinary Arts Center to Nyack on Wednesday, April 24th at 7pm . 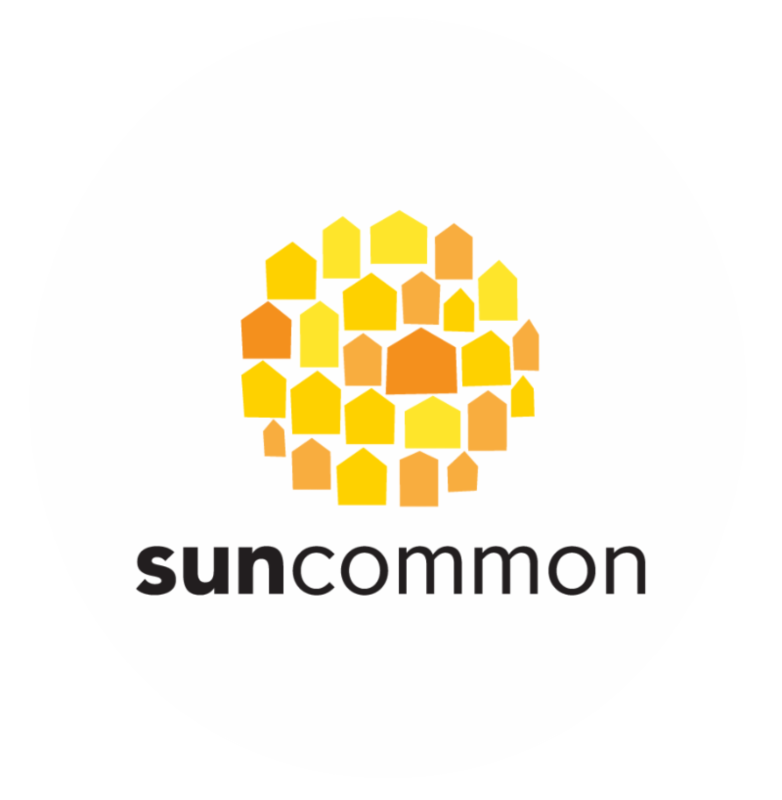 Hear about their new programs from Interim Director David Kimmel , take a tour, and enjoy a tasting from their new state-of-the-art kitchens. 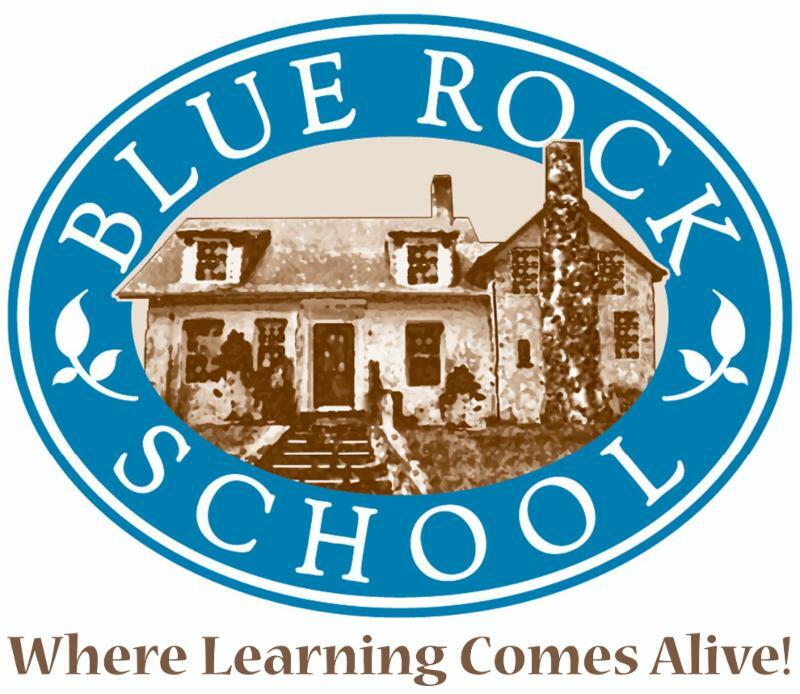 As an alternative, co-educational, independent day school for kindergarten through eighth grade, the aim of Blue Rock School is to prepare students to become responsible human beings through a balanced education of their minds, bodies, and feelings. 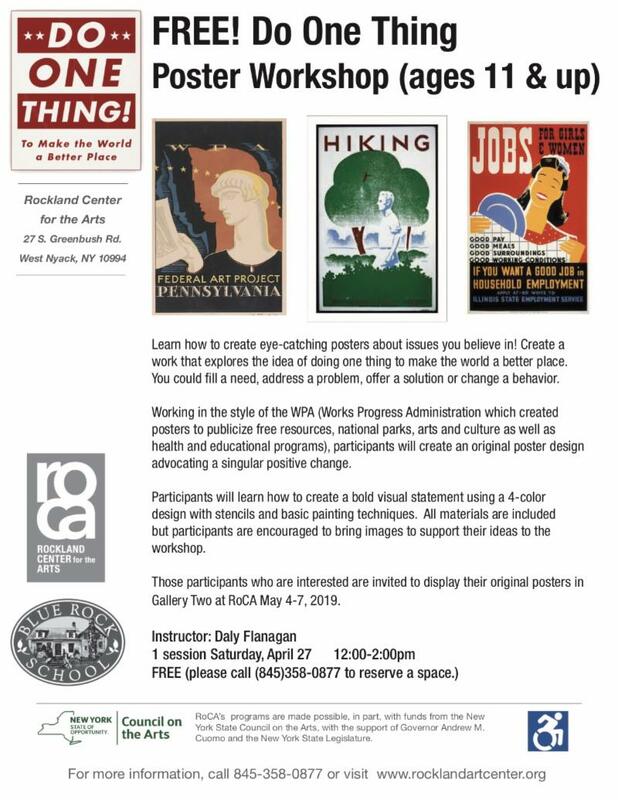 Please see below for more info on their Do One Thing poster-making workshop on April 27th and fundraiser on May 4th , in collaboration with the Rockland Center for the Arts . 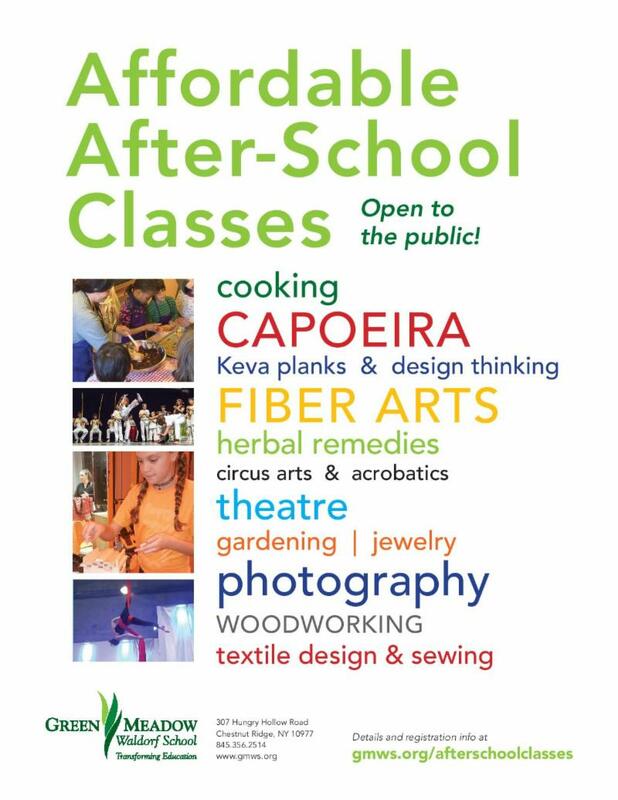 For the first time in their nearly 70-year history, Green Meadow Waldorf School is offering after-school classes, open to the public. All classes take place on their 11-acre wooded campus in Chestnut Ridge, in Rockland County, NY. Courses are run by teachers, parents, and friends of the school. 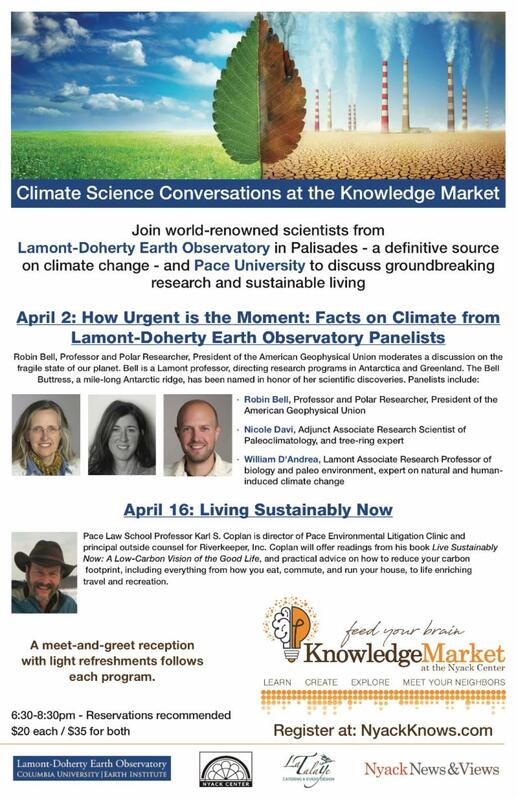 Curated by NyackNewsAndViews , the Nyack Knowledge Market welcomes world-renowned scientist from Lamont-Doherty Earth Observatory and Pace University for Climate Conversations on April 2nd and April 16th to learn more about the urgency we're facing and what you can do to live more sustainably now.